"Thomas and Guy-Man had a bunch of keyboards during these early [recording] sessions, like the [Sequential Circuits] Prophet 5, [Roland] Jupiter 6, Juno 106, Yamaha CS80." In this photo from the X&Y recording sessions, Chris can be seen with a Yamaha CS80 Synthesiser. It's been used by Chris widely in the studio as well as on tour. "Now headed to Switched On to see my CS80!!! Expect my instagram to explode. They spent 2 months installing MIDI. Driving here to pick up soon." In his "In The Studio" video with Future Music Magazine, Fred Falke plays with and records a CS-80. At 19:40 specifically, he begins playing the synthesizer's keys. "Met a new friend today, we clicked right away! Lets have some fun????" Hans Zimmer and Benjamin Wallfisch used a CS-80 in the Blade Runner 2049 soundtrack. Appears on the equipment list used to make Syro. In [this article](http://www.soundonsound.com/sos/may11/articles/sqpshr.htm), this photo of Squarepusher's Yamaha CS80 is included, along with the caption, "A recent addition that goes against Jenkinson's usual principles is his vintage Yamaha CS80 polysynth." He says, "Nick’s CS-80 ended up featured very prominently on this record. " At 2:10, the Yamaha CS-80 is being used in "Don't", just above the MemoryMoog Synthesizer. According to wikipedia.. Airey used that polyphonic analog synthesizer on Ozzy Osbourne's "Mr Crowley", and the glissando effect is heard prominently during the intro. Inside Subconscious Studios, Los Angeles, 2011. In the section of the source URL describing The “Human Nature” signature synth string part, quote: "That was Steve Porcaro’s track. He used a Yamaha CS-80 with glide (chromatic instead of portamento) at the head — it’s got that nice little CS fuzz around the sound. That fuzz was also part of a multi-layered sound I used for the four-chord basic string vamp on “Billie Jean” — Michael Jackson himself played that part on a CS-80 in one take." Kate used this synth on the album Never For Ever. "There's one synth that I'd used a little bit on my first album, but which Daniel Lanois re-introduced me to, and that is the Yamaha CS80. It has a great breathiness to it — human breath and its musical uses have always fascinated me — and a kind of organic character which I like." The CS-80 is used throughout this song "Confusion". In this photo posted to instagram, we can infer from the description that it is being used by Emily on the latest Metric works. While this unit is most likely the same one as owned by James Shaw, also of the band Metric, it is worth noting this instrument was a part of previous work on albums such as "Pagans in Vegas." Chris Taylor states in [this](http://www.americansongwriter.com/2011/09/qa-grizzly-bears-chris-taylor-on-recording-cant/) American Songwriter interview that he used a Yamaha CS-80 synthesizer. According to an interview with [Reverb.com](https://reverb.com/news/reverb-interview-rjd2-on-his-favorite-gear-and-artists-hed-kill-to-work-with), Ramble (RJD2) had used bought this instrument between 2008-09. > "Because the record I did the Song Exploder on, that album came out in 2010. And I used the CS-80 a lot on that recording." Also, on the new album Dame Fortune, he mentions the Yamaha as being used on the album. 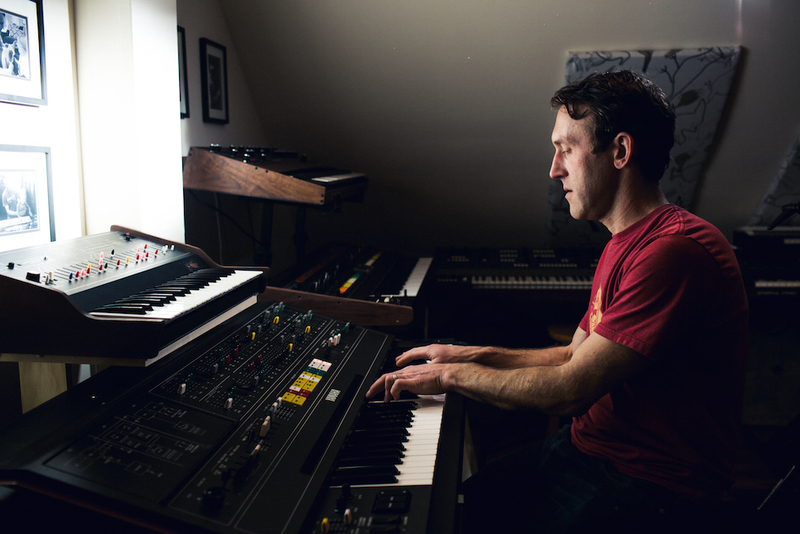 In an interview with [Thump.Vice.com](https://thump.vice.com/en_ca/article/rjd2-gave-us-a-guided-tour-of-his-columbus-ohio-home-studio), Ramble has this to say: > "The best polyphonic synthesizer ever imagined, in my opinion. Has graced countless classic recordings. I'm into this one for upwards of 30-50 man-hours, if I'm guessing. All five of the lower PCBs were rebuilt with modern components; hundreds of chips and capacitors were desoldered, and newly manufactured ones were put in place. It's now one of the most stable synths I own—just a dream to play. The first track on Dame Fortune, "A Portal Inward," is almost entirely this synth. I can't say enough good things about this machine." Dan posted this video on Instagram of him playing some notes on a Yamaha CS-80 synth. "I think some of the instruments go with the eras, really. The early synths, the genuine synths as opposed to the sampling instruments, that give you those fat sounds which are very present on albums like A Curious Feeling and albums around that period when I first started using synths, which I guess was around Selling England by the Pound, I suppose. Of the last one of those I used a lot was the [Yamaha] CS-80 which had a nice fat sound and was used on Duke and things. Of course, the Prophet  kind of took over after that being an important instrument on Mama and Abacab. " 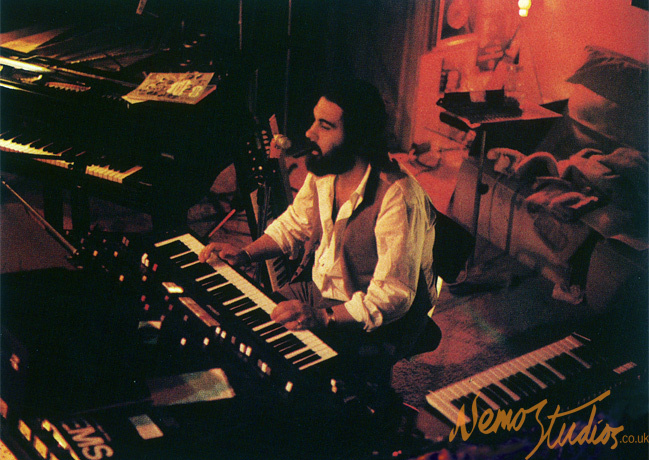 In this image, Vangelis can be seen sitting behind a Yamaha CS-80. "I started playing that prior to the recording of the Hot Streets album. I probably had one of the first ones that were actually taken on the road. It’s a wonderful machine. I found that I didn’t need the Hammond B-3 anymore when I had the CS-80. I use the organ voice a lot. If I want a Jimmy Smith sound, I use the 16’ and the 2 1/2’ or 2 2/3’. Then if I want the kind of sound I had in “Vote For Me,” I just push it down to the 2’ to bring up the brilliance and resonance a little bit, and fool around with the upper and lower keyboard balance. With that and the Leslies, it really growls." Quote from album "Oxygene 7-13" by Jean-Michel Jarre (1997 release): "Jean Michel Jarre played the following Instruments: 2600 ARP Synthesizer, VCS3 synthesizer, AKS, Eminent, Mellotron, Theremin, CS80, Quasimidi Raven, Digisequencer, Logic Audio, Akai MPC3000, Nordlead, JV 90, K2000, RMI, Prophecy, TR808, DJ70." Over the years, Ron Mael has played numerous synths, keyboards and computer-based instruments — Moog's Polymoog, Roland's JP-4 and JP-8, the Wurlitzer electric piano and the Fairlight CMI, to name a few — but his workhorse favorites have been the Yamaha CS-80 (produced in the late '70s) and the sleeker S80 (introduced in 1999). Andy McCluskey can be seen playing the CS-80 at 0:25 in the video. Colin Doroschuk used a Yamaha CS-80, Analog Synthesizer on Antarctica. "I've sold a lot of the keys that were very prestigious but I just didn't like that much,” he says. "The Minimoogs and the [Yamaha] CS80s, the Memorymoog, the [Roland] Jupiter 8… I think they are so overrated because they're really not that great." This article mentions the CS -80 a classic synthesizer also used by the member Alexis Taylor of Hot Chip . Seen in his studio ! Are they more like vintage toys or do you frequently use them in the studio? "I do use them on my tracks. If something needs to be done quickly I'll turn to plugins, but I also take the time to use outboard gear, especially the Yamaha CS80, which I use a lot for pads, or the Minimoog for bass." According to the "equipment list" found on Church Studios, owned by Epworth, one of the things listed is the Yamaha CS-80 synth. In one of his studios. He uses it for pads mainly. "I use mainly PCs, running Steinberg’s Cubase 6.5. My audio IO is a RME fireface. I just added a Dangerous Music D-Box to my setup so I’m finally enjoying the advantages of summoning mixing. Before the audio goes back into my DAW, I run everything through my Obsidian Compressor. It’s a simple but solid and good-sounding chain. I still use real keyboards, like the Korg MS2000, Korg Prophecy, Juno-106 and I’ve used a real CS-80 for my score on Mass Effect 3. I love the newer, more experimental synths like the OP-1 and all of the synths from Dave Smith. There are tons of other hardware gems I use, like Metasonix pedals and the Moog Froggers to name a few." Instruments around the room include a Fender Strat with a telecaster neck; a Yamaha CS80 ("still my favourite synth") and a MultiMoog, both of which he tries to steer clear of since they are distinctive of After The Fire days; latest acquisition: a Yamaha DX7 with the KX5 ("it's a dummy MIDI keyboard that works with the DX7 for slinging round your neck and posing with. It's great actually. It's got all the things the DX7 does; all touch response, breath control, modulation, pitch bend, sustain."). In this clip, Gilmour can be seen using a Yamaha CS-80. This synth was used extensively on Saga's "Silent Knight" album. My go to desert island choice. The best synth ever manufactured, period.